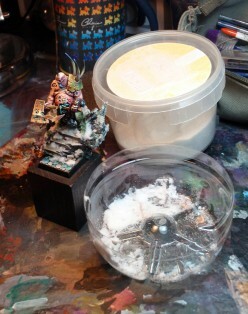 For this recipe, i’ll use glass powder, white pigments and gloss varnish. 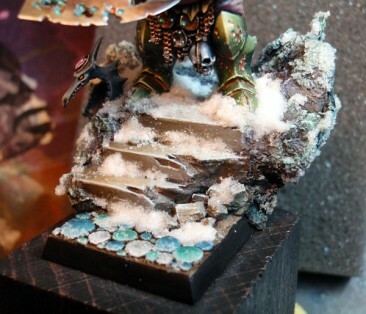 There are many ways to simulate snow on our miniatures. However, there is as many methods as there are different results. And the visual quality is not the same for each. It should be known that a beautiful snow require a lot of practice, but even more, quality products. Snow has to be shining, bright, reflecting said light. Even more, it must be credible in terms of volume. Beware however, I’m not here to give THE method to make snow. The following technique is most appropriate for showcase miniatures. I would never see myself doing this for a whole army. 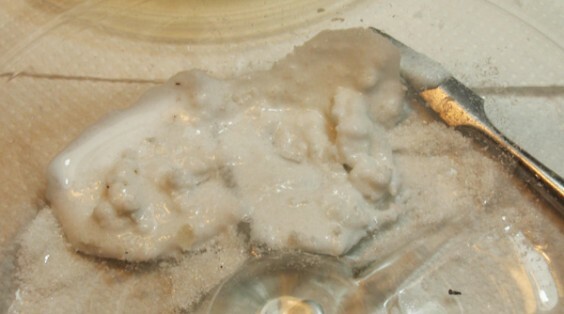 Baking soda is often used with PVA glue, and it is the most commonly used technique. It is totally correct for gaming, for the good and simple reason that the end result clearly shows what we tried to represent. However, the result if often too smooth, spread, and mostly matte. -Very fine white pigments (used in railroad model making). -Glass powder (a product that is sale forbidden in some countries and hard to make yourself, because of the grain size needed). Do not use silica powder, which gives a very different result (somewhat similar to melted snow, and which reflect less the light). 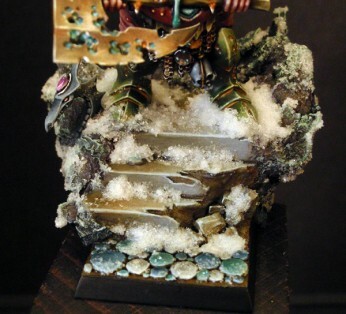 You can find some “Crushed Glass Snow” from Secret Weapon Miniatures. -Spatulas, a flat brush, an old brush (that will serve for the varnish). In a ramekin, I mix it all until I get a paste with a similar texture to toothpaste, but a little less compacted. 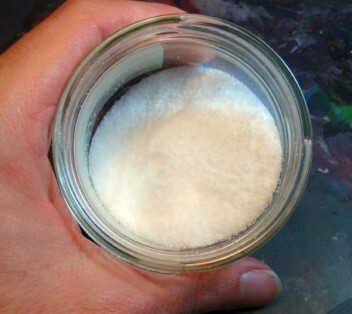 I don’t only use PVA glue and glass powder, as the later, unless used in great quantities, stays a little too clear. The white pigment will be correcting just that. The glass powder is there to cause the reflection of the ambient light. In fact, even if it is very fine, and as opposed to silica powder which is truly a powder, this one is made also (and mainly) of small glass shards, more or less triangular, and of various sizes (about a millimeter). Thus we get zones which, once the miniature is turned or manipulated, create very credible flashes of light. I now come to the usage precautions. 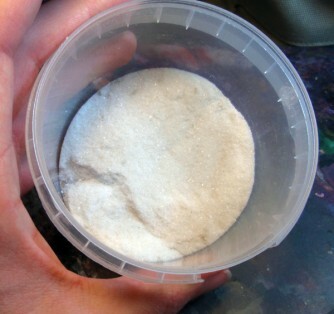 If glass powder is not easily found in your area, it is not a coincidence. As the name implies, it is made from glass in a powder state filled with very little crystals. The result is thus very dangerous. So we have to work as much as possible outdoor. If this is not possible, we protect the work surface with plastic film or news paper, which will receive whatever might be spilled, and will be rolled in a ball, starting from the edges, then thrown in the garbage. Also very important, we work with gloves, safety glasses and a mask. 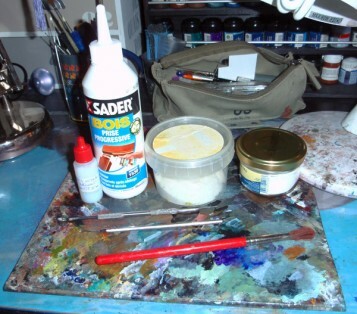 Being well protected, I then proceed to apply my paste, with a spatula, to the base and the miniature. For volumes, I drop motes, which I will work afterward with a small brush, and gloss varnish. The varnish will dilute the mix and allows defining the general shape. Concerning the distribution, we must remain credible. There would be snow upon leaves, but not under, etc. Once this is done, I spread pure glass powder over the whole thing. You surely understand now why this is not convenient for gaming pieces. This technique, to be seriously and thoroughly used, requires precision, patience, and a lot of cautiousness. Thus it takes time! On my diorama “Until the End”, the snow took me at least ten hours to be correctly spread, and above all, correctly secured: a large portion of the snowy rocks being further than the base and thus submitted to manipulations. The unfortunate facet of this method is that the most beautiful snows do not show through pictures. This is normal as the glass powder crystals will only shine when you move a miniature in your hand, or by looking at it from various angles. Same for the compact or thinned mass effects; this comes from the volume of substance. In a picture, we only see a white mass. You only have to look at “The Race” from Axel de Mohrenschildt to have a perfect example. There is some great work on the glass powder on it. In hand, it sparkles like stars! On a picture, it’s just plain white. But trust me, in person, the effects are remarkable. 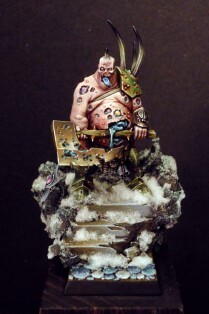 While we’re here, for those interested, you can see more pictures of these effects upon my Nurgle Lord.